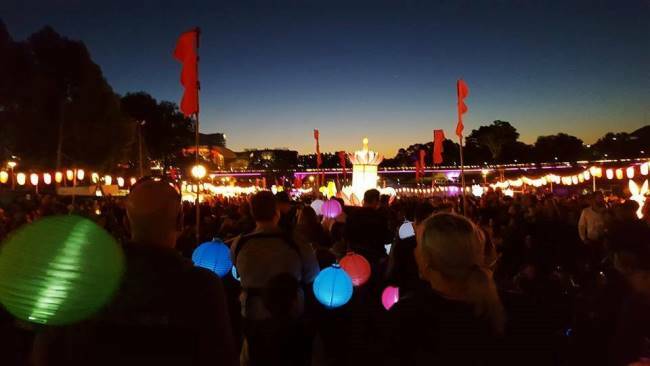 Staff from the Department for Communities and Social Inclusion joined thousands of people at the Moon Lantern Festival on 1 October. The festival and its much-loved lantern parade lit up Elder Park and ended with a fireworks display. A series of large lantern installations, roving performers, workshops and family activities rounded out the free family event, which was part of the OzAsia Festival. The annual event acknowledges the Chinese Mid-Autumn Festival, a celebration dating back more than 3000 years. This year the parade was preceded by a special procession of 40 Chinatown representatives carrying small lanterns from Chinatown through the streets and laneways of Adelaide to Elder Park. The State Government provided $52,000 in funding to the OzAsia Festival, which is a significant platform for celebrating the diverse arts and culture from Asian communities in SA. It is also one of Australia’s leading arts festivals. DCSI staff carried lanterns in the parade to promote the November 2017 Multicultural Festival, which celebrates South Australia’s cultural diversity and is the largest of its kind in the state.